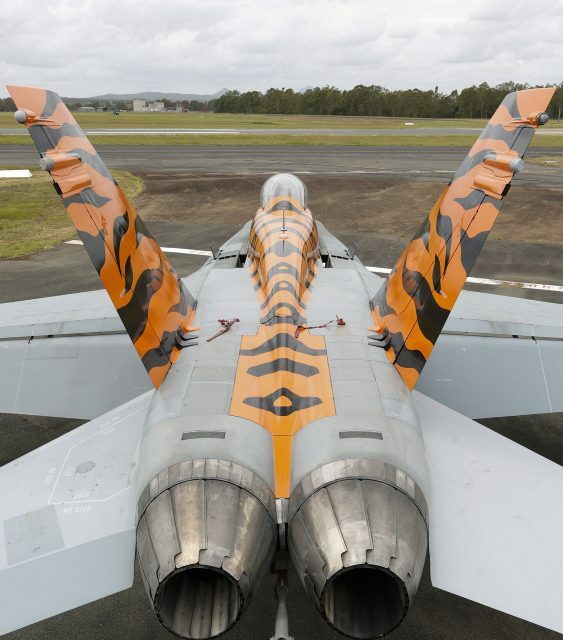 A Royal Australian Air Force F/A-18B Classic Hornet returned to its base at Willimtown in New South Wales with a brand-new paint job. The distinctive design features black on orange tiger stripes along the dorsal spine of the No.2 Operational Conversion Unit (2OCU) aircraft and on the inside of the vertical fins. The outside of the fins features the 2OCU Tiger head on a black background. The new paintwork celebrates the units final year of Classic Hornet operations, primarily training pilots to fly the F/A-18A-F/A-18B aircraft.